More than 100 goats have burst into a neighbourhood in Idaho’s capital city, startling residents and captivating spectators on social media as they feasted on lawns, flower bushes and tree leaves. 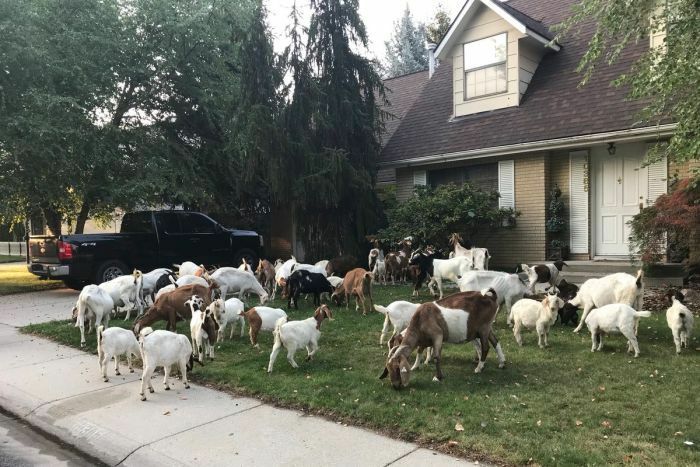 Multiple news outlets captured the goats calmly eating grass and shrubs in a Boise neighbourhood before a trailer arrived amid applause from local residents. Brooklynn Jarvis said she was awakened by a call from her mother. “So I put on some clothes and ran out and there’s like 100 goats on our street,” she said. The goats had been corralled near a local retention pond to eat weeds and other overgrowth, but — perhaps noticing the grass was greener next door — broke through a wooden fence to roam the neighbourhood.